aditus foundation wins Active Citizens of Europe Award! 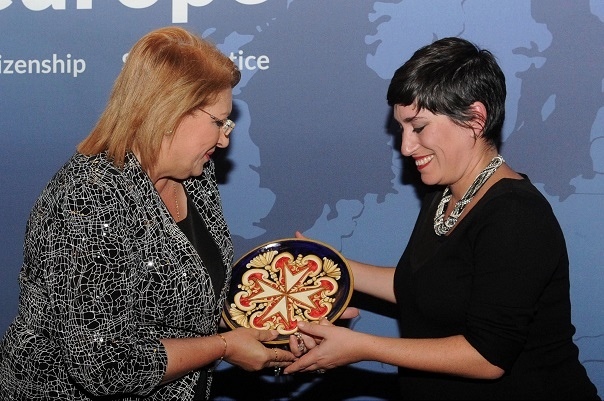 Carla (Legal Officer) accepting the award from the President of Malta. On 13th November we were awarded the prestigious Active Citizens of Europe Award by the organisation Volonteurope. The ceremony was held during Volonteurope’s 23rd Annual Conference in Malta, discussing the theme of migration. Our Director delivered a key-note presentation on ‘A Rights-Based approach to Migration’, to be uploaded on the Volonteurope site in the coming days. We thank Volonteurope for acknowledging the work we do in the human rights sector, and take this opportunity to express a heartfelt thanks to all the volunteers and interns who’ve given aditus so much of their energy!